Car buyers in Europe will soon have four new swoon-worthy electric Renault cars to green their driveways – and the rest of us are green with envy. 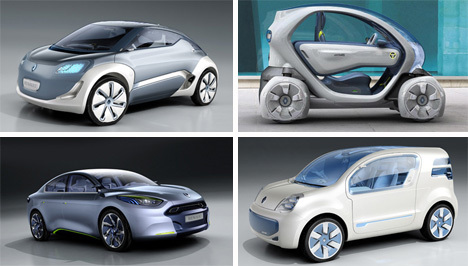 Renault announced their new fully electric line, called Renault ZE (zero emission), at the 2009 Frankfurt Motor Show.The line consists of a tiny two-person (one in front, one in back) urban car, a “light commercial” vehicle designed for professionals, an electric family car that looks like a short SUV, and a five-passenger “city car.” The company says the line will be offered for purchase as soon as 2011. 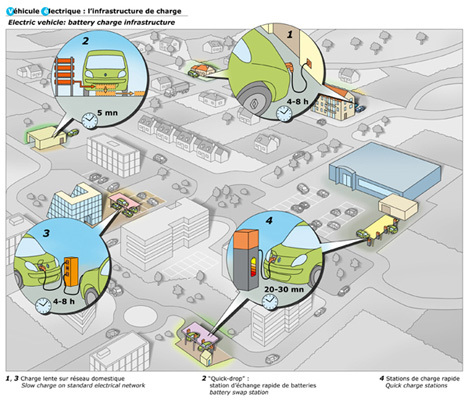 While the cars themselves are quite fetching, it’s Renault’s concept for battery exchange that has us all atwitter. Rather than purchasing rechargeable batteries with the car, they propose renting batteries. Owners would be able to charge them at home or work via the normal electric grid (which takes four to eight hours), while keeping spare batteries in both locations. Ideally, public places like shopping centers would also offer rapid recharging stations which would give the battery a full charge within 30 minutes. But for even faster service, owners could visit one of the battery drop-off locations (which Renault say would be located in service garages) to get a freshly-charged battery within five minutes. This multi-faceted battery plan would help ease the minds of some car owners who have a hard time believing they would be able to cope with an electric car. 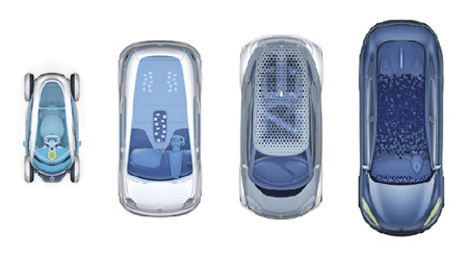 Having multiple options for keeping the battery topped up makes the concept easier to swallow. The car manufacturer’s website doesn’t indicate the capacity of the batteries, but Renault are hinging the electric cars’ future success on the relatively short drive times of European commuters: 80% drive less than 60 km (about 37 miles) a day. For suburban Americans with hour-long commutes each way, this particular type of electric car may not have enough juice to last them an entire day. The cars have already been previewed in several venues in Europe and journalists have been given a chance to drive one of them; so far, the reviews have been very good. They’re described as quick, responsive and simple to drive. Hopefully we’ll see viable all-electric cars debuting around the rest of the developed world soon, right after networks of charging stations are put in place.